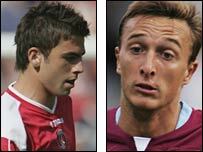 Ipswich have signed West Ham midfielder Mark Noble and versatile Charlton star Simon Walton on loan. Noble, 19, has now joined on a three-month loan after spending the week training with the Town squad. He put pen to paper on Friday, as did Walton, 18, who can play in midfield or defence and has joined Jim Magilton's side for a month. Walton only joined Charlton from Leeds on a four-year contract in July, having made his Leeds debut aged just 16. The Hammers have the option of recalling Noble after a month.